brooksy wrote: Drop over any time. Thanks, will do would be good to have a look over the machine. Still have 3 more weeks away at work yet ,I give you a call after that. Finally got around to getting a set. Airbag compliant alternative from Xrox only protected underneath and not the side. Anything non-compliant they tell you to take it home and stamp receipts with off-road use only, so the onus is not on them should they interfere with air bags in any way in the event of an accident. However in a recent conversation with an RACQ regarding air bags in this regard, he could neither confirm nor deny the legalities and/or implications of fitting rigid-to-the-chassis rail mounted rock sliders. He refereed me onto DoT. DoT however only state things like, as long as they as pedestrian friendly etc. Everyone seems more concerned with frontal impacts than side impact and I got the feeling nobody is qualified enough to give a proper response. Sometimes they don't understand the original question and go off on other tangents not really giving the information you need, so you have to reply and ask again in two words instead of the confusing three. I carry children in my Hilux that is equipped with side air bags. I need to know. All I understand is that air bag systems work off angle and inertia sensors. Fast and early deployment is vital to an airbags effectiveness. It all happens in milliseconds. So I bit the bullet and went the solid rock sliders for the side protection, side steps and a jacking point if need be. Will upload a picture later on in life here. OK, seen as freighting/couriering these isn't easy, what are the options? Any recommendations? Courier to Beerwah shouldn't be too bad. Should be about $65-$75. To Kingaroy it was about $90, but you en' route to Brisbane so it shouldn't be too bad Dave. Otherwise, A drive to Maroochydoore and BBQ or counter meal would make it worth while. I have little ones in tow, so they'll enjoy the day out at the beach. This guy will line up a courier for you. I got mine made with the angled pillars to the outside rails. He charged $100 just because it's not as easy as straight hole sawing and doesn't fit in the standard jig when he puts them in. I thought $100 was a bit much considering I'm already paying a premium on them. They're pretty good though. 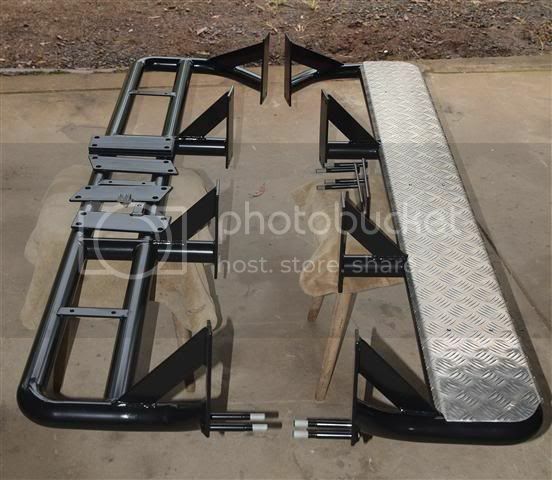 Shaker4x4 wrote: .......the legalities and/or implications of fitting rigid-to-the-chassis rail mounted rock sliders. Not any legal interpretation or anything, just my considered opinion. And happy for it to be used/shared with authorities. Consider what effect the addition of rocksliders/side-steps will have on an airbag system in the event of a side impact? Simply put the increased rigidity would likely increase the peak impact force felt and trigger the airbag system earlier rather than later. The airbags may trigger upon impact with the sliders rather than waiting until the mass hits the chassis under the floor. Yes we're only talking milliseconds difference, but to an advantage, not a disadvantage. That key point alone should be seen as a positive attribute. It would also help prevent the impacting object/vehicle from penetrating as far into the passenger compartment. Which is what the ADR required side impact beams inside the doors are for. Also, for the benefit of the vehicle impacting the side, it would cause it to initiate it's front crumpling earlier (triggering it's airbags if fitted) and thus reduce the peak impact force for it's occupants. When DoT talk about pedestrian safety, they simply mean nothing sharp or protruding too much that would injure a pedestrian if they were to be foolish enough to walk into the side of you as you drove past. So keep it neat, tidy and well finished. No bolts sticking out etc. Yeah. I was thinking Beerwah/Sunshine Coast to Rocky actually. I've got an order for a set for a 100 series 'cruiser coming up soon. Ahhh I see. Nice sliders in the pic btw Have you done any for 05+ Hilux D/C before Dave? The guy at Maroochydore can't keep up. Mine were on a 1.5 month back order! You'd have to like repetitious work and welding all day too.